Our rug cleaning expertise and facilities are world class. We clean about 30,000 rugs each year. Our clientele ranges from homeowners, rug collectors, designers and celebrities. Virtually anyone who needs to know their rug and home furnishings will be handled professionally, yet with personal care. Before you replace your worn or damaged rug, please contact us. Our master craftspeople can do almost any type of repair on antique and contemporary rugs and carpet. 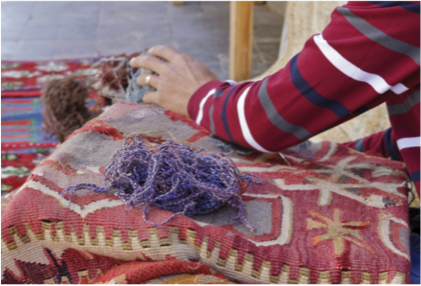 We can repair your cherished rug and restore it to pristine condition. We use the carpet and upholstery cleaning methods that is most often recommended by respected manufacturers. Only, we improve on it. See how we do it. Rug Renovating is the greenest cleaning company in the county. We offer family-safe and environmentally friendly cleaning agents. Our firm utilizes solar power to minimize the environmental impact of our cleaning processes. and we currently make more electricity than we use annually.